Remember my lofty ideas of having my fabric designs all ready to go? Well, all that got postponed as you can tell. 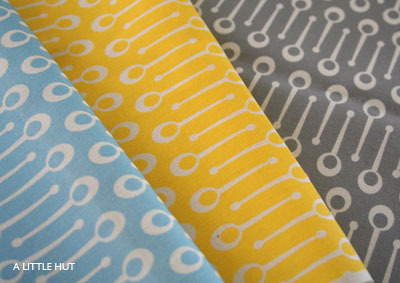 I only have two new colors of the previous fabric design to show you for now. I realize they're not really fall colors but it's hard to get into the cooler spirit of things when we're still in the 80s around here. I'm selling them as fat quarters for now because I'm trying to find a more reasonable alternative for selling these by the yard. So what's up for the weekend? I will definitely tackle my office. No big decorating involved though. More of a purging that needs to happen asap. Making 33 projects for the book put a serious dent into my efforts at staying organized. There are sheets of paper and sample projects everywhere. The minute I finish this post that's what I'm tackling today—oh yeah, and that thing called laundry. After I pick up the kids from school we're off to a birthday/halloween party. D is going to be Darth Vader (he's all about Star Wars nowadays) and our girly girl wanted to be a ballerina this year. The countdown to being able to use their costumes for the first time this year has finally come to an end. Thank goodness—now just looking forward to the after-party sugar high. Thank you to Apartment Therapy for featuring yesterday's cereal box organizer and a huge thank you to Natalie at Craft for featuring A Little Hut as part of the series of 'blogs we love'!!! I'm so very flattered. What a great way to end the week. And welcome to those of you that are new to my blog. I hope you stick around for a bit and look around. I have read your blog for some time now and really enjoy getting to know you little by little. I am an artist living/working in San Diego and trying to find my way in the arts/crafts world. I am glad your recent health issues are behind you. 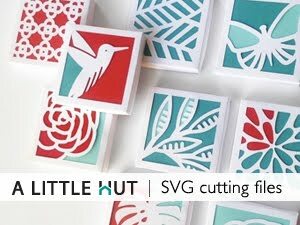 Your paper cutting and your designs are very classy and very accessible at the same time and your blog has been a great find for me - connecting me to many other places. So when you asked about some links, I thought - this would be a great time to introduce myself! The recycled projects are specially dear to my heart - and I wanted to share mine with you - http://www.hansaarts.com/recycled-projects.html and hoping maybe we can start some discussion on some new ones. Am waiting to buy a glue gun so I can try the 'magazine bowl' you have on your blog. These look great! Good luck with your new endeavor! My weekend will be a relaxing one, but unlike my husband, mine will not be a 3 day weekend- I've got tons to do when Monday rolls around.